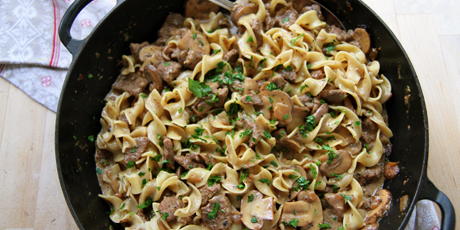 I think Beef Stroganoff has been turned into too many instant and frozen entrées, that we’ve forgotten how delicious it is. And Stroganoff is actually easy to make, only takes one pan (plus the pasta pot) and comes together as quickly as any pre-fab version. You might also like these Popular Beef Recipes. 1. Heat the oil and butter in a wide braising dish (sauté pan with a lip) over medium-high heat. Toss the beef with the flour and add to pan, cooking until lightly browned. Remove the beef and add the onion, sautéing until the onions have browned a bit. Add the mushrooms and sauté until tender, about 5 minutes. Add back the beef, along with the thyme and stock and bring up to a simmer, cooking uncovered for 10 to 15 minutes until the beef is tender. 2. When ready to serve, stir in the sour cream and season to taste. If the egg noodles have been pre-cooked, rinsed them under hot tap water, drain well and add to the pan, tossing to coat. Stir in the parsley and serve.